In my opinion, this is the most talented team that we have had since the Bird era. 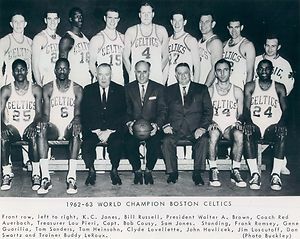 I wouldn’t go as far as saying that we are as deep as the Russell team (Pictured Below) that had 9 future Hall of Famers on their roster in the 1962-63 season. Needless-to-say, they won a championship that season. That was their 5th in a row, eventually setting the record with 8 in a row. But we are solid. We have so many starting lineup possibilities, and our bench can most likely beat any team outside the top 10 on any given night. We have added depth beyond anything that we have had before, including our 2008 team (Pictured Below) which was basically P.J. Brown, Leon Powe, James Posey, Big Baby, and Tony Allen, with Sam Cassell doing minimal work. 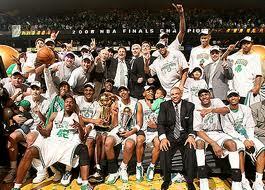 We now have Jason Terry, Courtney Lee, Jeff Green, Leandro Barbosa, Chris Wilcox, and rookie Jared Sullinger. Most of these players with the exception of the last 3, could be starters on most teams in the league. However, every other team has gotten better too. Therefore, I am not predicting a championship just yet. The Thunder didn’t do much, but they are one year more experienced. Their chemistry is their biggest upside. Oh, and the fact that Durant can drop 30 points every game if he wanted, Westbrook isn’t too shabby either. The Lakers have added Steve Nash and Dwight Howard to team up with Kobe and Big Bird (Gasol). All of whom are future hall of famers. Plus, they have Kobe.. The Heat are still the favorites. They added Ray Allen and Rashard Lewis, both can knock down a 3 anywhere on the floor. This will spread the floor so that Lebron and Wade can own the inside. They shot less 3’s than any other time in their career last season, and now they won’t have to shoot any. The league wasn’t like this when we won in 2008. All of these players were spread out across different teams, other than the Lakers. There has been talk about the league wanting to get smaller, keeping only the largest market teams, but that has been turned down numerous times. However, with all of the players forming super teams, it basically is contracting itself anyways. Who is your favorite for the NBA title this season? This entry was posted in Celtics and tagged 2012, 2013, barbosa, basketball, Bass, bosh, boston celtics, boston sports blog, bynum, celtics, championship, Doc Rivers, heat, Howard, james, jeff green, Kevin Durant, kevin garnett, lakers, nba, paul pierce, rajon rondo, sullinger, Thunder, wade, westbrook by christoph131. Bookmark the permalink.